I’m a crafter and writer in Portland, Oregon and the author of four other craft books. 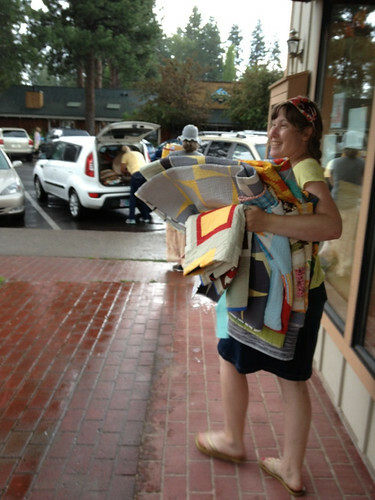 I love shopping for fabric, printmaking, sewing, and making quilts. You can also find me at my craft blog, West Coast Crafty. at the 2012 Sisters Outdoor Quilt Show! Susan, I’ve had fun using your book learning to make quilting projects. I’m am totally new to it and your work is so inspiring and beautiful I decided to give it a try. My first project was to make a charming camera case and have had a very difficult time with the bias tape around the top. (produced a blood satin on my blue bias tape 🙂 ) Do you have a special sewing machine that allows you to sew around this tiny opening or could you share your technique so I can produce a better finished product. Again, thank you for sharing this craft with the me. I am excited to get better and make gifts for others to enjoy! Hi Shelley! Thanks so much for your kind words and comment. So sorry to take a few days to reply – this got caught in my wordpress filter and I didn’t see it right away. To add the bias tape – first, I used very, very wide tape (about 2″ across flat, sold in stores sometimes as hem facing or quilt binding) which helps sandwich all the layers in neatly. I sewed pretty slowly, close to the bias tape’s edge, and gently rotated the opening of the case forward in the stitching direction as I went so it didn’t get caught up with the foot. It is a small opening, so I know it can be tricky to stitch… sorry about the bloodstain, I have been there with crazy sewing projects many times! I took some photos of my process of making and sewing the whole camera case and would be glad to do a post on it with some details in the next couple of weeks if that’s ok? I’m getting ready for Maker Faire and my Bobbin’s Nest event (yay!) but when I’m done with those two events I’d love to post about it. Thanks for publish such great book…!! So far, I had completed the quilt top, the next step quilitng the sandwich. Looking through the back photo of the modern cross quilt that showed on the book, I could not see any quilt pattern on them, not even stitch in the itch. The back quilt looks so marvellously great with a big cross on them!! Just wondering what kind of the quilt patten do you quilt them? Thanks again for ever publish the GREATEST book! I’m having a difficult time w/Modern Crosses Quilt. Did you do a tutorial on the process? I don’t see any corrections to the pattern. My squares are wonky when sewn together. Using 2 1/4 x 2 1/4 center sq sewn together, then add 2inch logs…..what am I missing? Please let me know if you need more specific advice, the chain-piecing technique really makes the block-building efficient (as you can see in Jen’s post). Thanks so much for your comment, I hope my answers and links give you some helpful ideas! I absolutely love your book and just finished my first project, the cheerful pot holders. I did have a bit of trouble applying the bias tape, but just concluded that practice makes perfect. I do have a question regarding the assembly of logs. On page 28 and 29 you show how to assemble a block. In step 3 it says to neatly trim the additional length of fabric from the log and set it aside. Now skipping to the pot holders, I followed this procedure while doing the pot holders. I trimmed the additional length and set it aside for the next tier that would use that fabric and so on. When I was finished with the project I found myself with numerous scraps that had been trimmed from the final tier. Although these scraps were only 2 or 3 inches long, it seems like a small waste of fabric. So, why are the measurements for each log a tad longer than what you actually use? Hi Lesley – just saw this, sorry to take so long to reply, it got caught in a wordpress filter! I wrote the potholder directions this way so that people had the most design freedom for placing colors, patterns, and logs where they liked, instead of having to choose in advance and follow an order from shortest to longest. In general with the measurements, it seems like everyone pieces a bit differently, so sometimes people who use scant seam allowances and trim differently go through strips more quickly than people who use a generous 1/4″ and trim closely – so I wanted to have some cushion there. I think those little scraps are so nice to have for a improvisational block or piecing into a binding as a decoration, if you still have them around! Hi Crystal, thanks so very much for your kind words on the book! I’d love to see your quilt and happiest birthday to your daughter! I haven’t posted recommendations before, but I’ve made a few simple sleeves by just stitching a tube of fabric the width of the quilt and then hand-basting it to the top of the quilt back, then running a dowel through. For the small, lightweight quilts in my kids’ room, I sewed a series (4 or 5) of small bias tape loops to the top edge of the quilt and hung them on little hooks. Corners sound like a very nice idea too. I hope this helps and that you’ll post a picture of your daughter’s quilt in the book flickr pool – I’m so happy you love it so much! !